The index opened flat to negative around 7695 and stayed weak for the major part of the day but saw huge short covering rally in the last hour of trade to close positive at 7714.90, gain of 10.65 points. The broader market was positive with 843 advances to 717 declines. The range till expiry is 7300-7800. 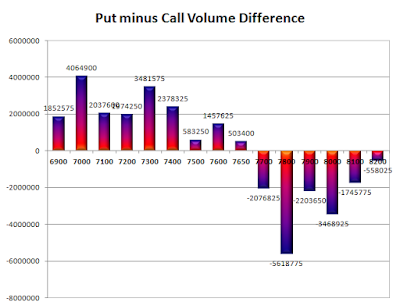 Call option 7800-8200 added 18.74 lacs OI with short covering seen at 7700 and below strike prices. Put option 7800-7600 added 12.61 lacs OI with profit booking seen at 7500 and below strike prices. Nifty Open Interest is at 2,10,95,025 down by 4,13,400, whereas Apr series added 3.06 lacs with increase in price, mostly roll-over with short covering. Bank Nifty Open Interest is at 24,57,900 up by 1,07,550, whereas Apr series added 0.20 lacs with increase in price, most probably huge long build-up in both series. 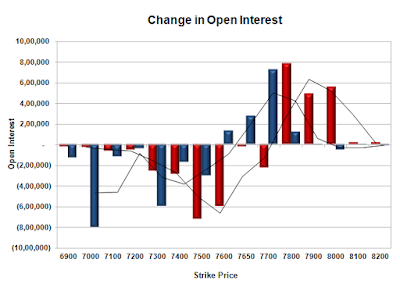 FII’s bought 0.72 lacs Futures, which includes net 4980 contracts long build-up and 2104 contracts short build-up, with increase in net OI by 7084 contracts, includes 36909 longs to 34033 shorts for the day. 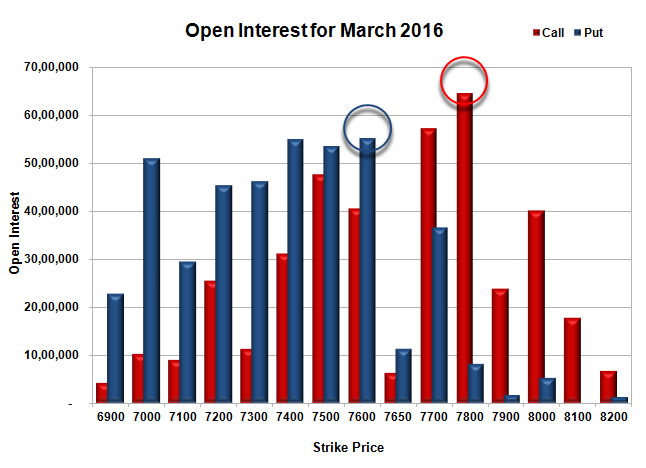 FII’s Index future open contract as on date is 222398 Longs to 134035 Shorts, Net 88363 up by 2876 contracts. 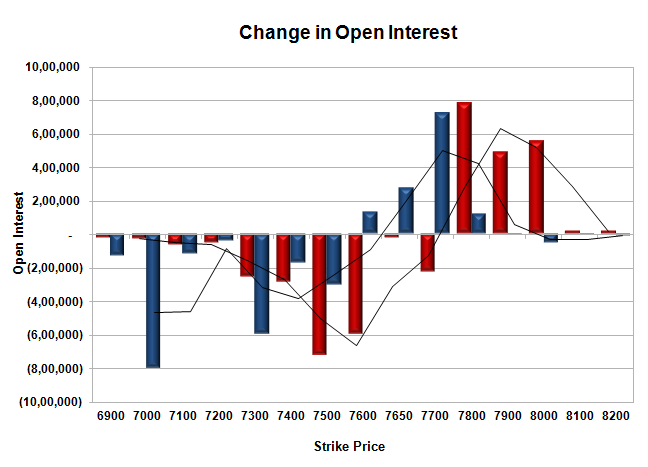 Initial support at 7700, with huge OI addition of 7.25 lacs and below that at 7600 with OI of 55.11 lacs. 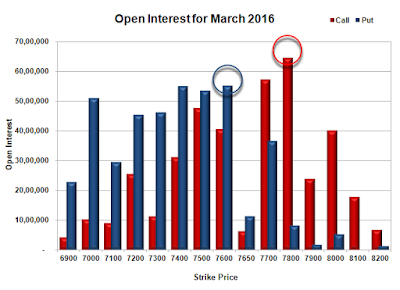 Initial and best resistance at 7800, with highest OI of 64.53 lacs. 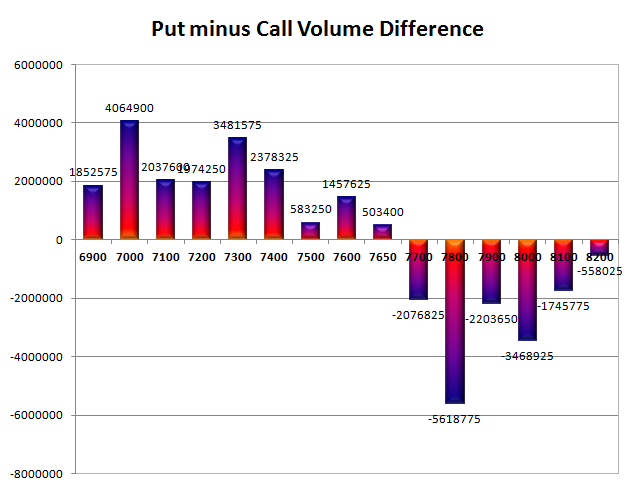 Day Range as per Option Table is 7625 - 7776 and as per VIX is 7649 - 7781 with 7696 as the Pivot.